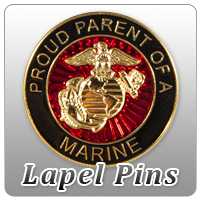 Marine Corps themed holiday ornaments to decorate your Christmas tree. This U.S. Marine Corps™ Christmas tree ornament is a wonderful way to pay tribute to the Marine in your life. This ornament features a glittered Christmas tree decorated with ball ornaments and USMC™ logo ornaments topped with a silver star. The tree has a silver banner underneath with the USMC™ logo and room to personalize. I love all of MarineParents ornaments!